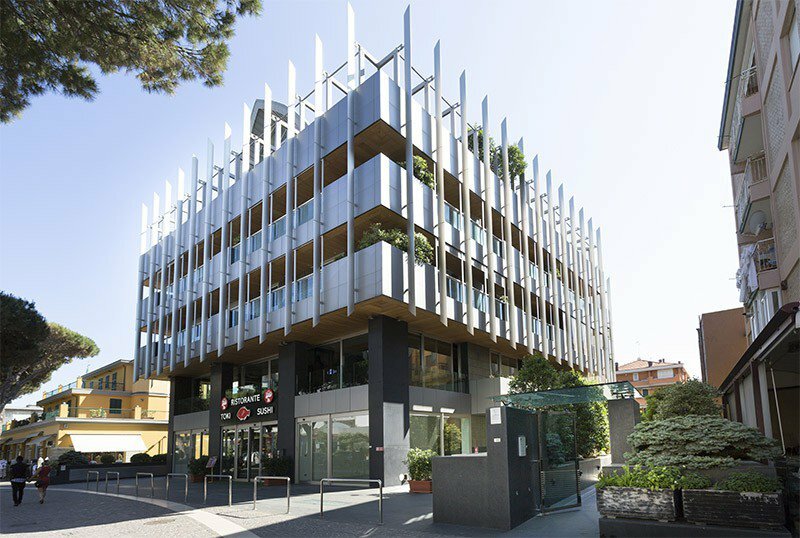 Residenza Barcellona is a recently built 4-star hotel located in the Marina Centro area of Rimini, close to the beach and the historic center. It offers elegantly furnished two and three-room apartments with WI-FI and air conditioning. On request: underground parking, cots and high chairs for children. Animals are not allowed. The property is located in Rimini in the Marina Centro area. It overlooks the promenade of Viale Vespucci, full of shops, restaurants and ice cream parlors. The sea is just a few steps away and the historic center can be reached in about twenty minutes on foot. The city bus stop is just a short distance from the hotel and in about ten minutes you can reach the train station and the historic center. Two-room and three-room apartments are available, all furnished in an elegant way and with attention to detail. They consist of living room with high quality finishes, kitchenette (with oven, dishwasher, fridge), bathroom with shower and hairdryer, equipped balconies with sea view on request. They have WI-FI connection, air conditioning, safe, washing machine. On request: daily cleaning. The structure is characterized by large common areas and sophisticated architecture. It has an elevator and an entrance directly overlooking the promenade of Viale Vespucci. PARKING: ample underground parking on request. WI-FI: available in all apartments. AIR CONDITIONING: available and free throughout the structure. CONVENTIONS: restaurants in the area, beach and amusement parks. The structure has an agreement with the Bagno n. 39, with playground area, entertainment for adults and children and lighted sports fields even in the evening.